Since we were children, we all dreamed of having our own pool. Now that you own your own house, have kids or your kids have gone off to college, you feel it’s time to make that dream come true. Question #1: What’s the Purpose of Your Pool? Obvious at first glance, this question is actually the most important to have a definite answer. Pools have many benefits, but each pool is designed for specific purposes. 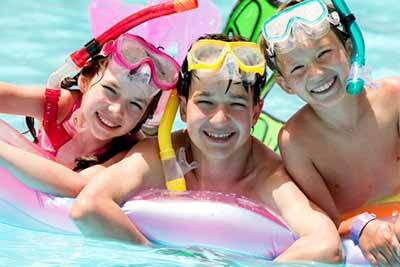 Are you more interested in relaxing, entertaining, water sports, slides, laying out or diving? Different usages require different lengths, depths and areas around the pool. You can definitely have more than one purpose for your pool, but make sure your priorities are in line before you start digging. Question #2: How Will Your Pool Fit In? A pool can add a lot of ambiance to your home but it can also look out of place if your not careful. Make sure you think about what type of pool design matches your home. For example, don’t install an olympic-sized pool if it dwarfs your house. If you plan on ever selling your house, the next owners may not like that so much. Question #3: How Will You Access Your Pool? How will you enter the pool from the house? Do you have the proper decking, steps or easy access from your home? You want to make sure that you and your guests can conveniently enter the pool without having to walk out the front door on go through a gate. Trust us, you will enjoy your pool much more if it’s not a hassle to go swimming. Question #4: Have You Checked on Local Codes? If you haven’t looked into local codes for your pool, don’t worry too much. We can help you with this process or at least give you some guidance. Local codes can block you from doing certain things and most codes require you to have a fence around your pool, which will definitely add some additional investment if you don’t have a fence already. Of course, there are many other things to consider while planning your new investment. Don’t get overwhelmed, we’re here to help. It doesn’t cost you anything to have us come out, talk with you about your plans and give you an estimate. We’ve seen many ideas, both good and bad, and we can assist you in making the best decisions for you and your family. Learn More About Your Pool! Contact us today at 479-502-3040 for your free estimate. We're happy to visit your property to discuss your dream pool! Learn tips and tricks to keep your pool clean and ready to swim all summer! Stay up to date with the latest news and information about outdoor spaces and safety. Copyright © 2014 Indian Summer Pool Company. All rights reserved.